TABEDE is a 3 years project funded by the European Commission that aims to allow all buildings equipped with Energy Management Systems to integrate energy grid demand response schemes, independently of communication standards. Develop an interoperable, DR-ready BMS extender that is compatible with at least 90% devices and systems—to integrate with existing BMSs, additional appliances and sensors currently deployed in buildings, and to the grid or campus like management systems—utilising the corresponding APIs, protocols, and standards. Ensuring beneficial impact (cost and energy saving) for building stakeholders. Specific interface encapsulation with an MQTT client and existing BMS or appliance networks; and Context-aware communication with smart grid. 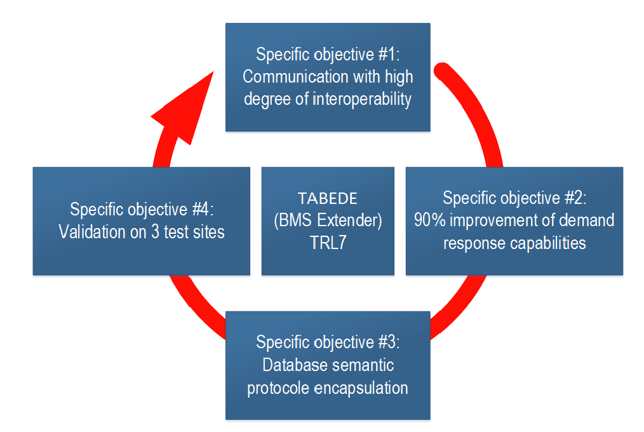 Demonstrate TABEDE technologies and functionalities through extensive simulation-based testing, and prove the feasibility of the proposed solutions through deployment of TABEDE on three test sites that are representative of EU conditions in terms of climate, building occupancy and energy infrastructure.